Robson Green and his son play paintball with Delta Force in Surrey! 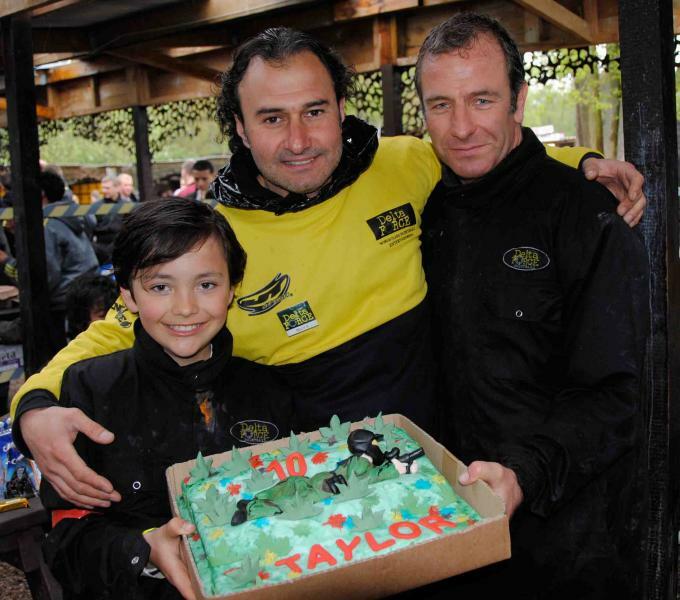 Over the May bank holiday weekend, Delta Force Paintball in Effingham, Surrey, was proud to host a paintball birthday party for Robson Green’s son, Taylor. Happy belated birthday Taylor from everyone at Delta Force! Taylor turned 10 this weekend and decided to celebrate with a day of paintball at Delta Force. They both had a wonderful day and even brought their own paintball themed birthday cake to the centre. Robson Green is one of the UK’s best-known television actors, starring in a wide variety of programs such as ‘Casualty’, ‘Northern Lights’ and ‘Wire in the Blood’. Robson now presents two of his own TV programs, ‘Robson Green Extreme Fishing’ and ‘Robson Green’s Wild Swimming Adventure’. Everyone at Delta Force would personally like to thank Robson and Taylor for choosing to play paintball with us and we wish them all the best for the future! Our paintball centres in Surrey have been a hotbed of celebrity activity recently, click here to see what other stars have played paintball with Delta Force.